GREENFIELD — The plan to quickly provide more shelter beds for the homeless, especially those who had camped on the Greenfield Common for nearly two months this summer, has hit a snag. At the same time, city officials are working with social service agencies and some lawmakers on a longer-term answer to homelessness in Greenfield. 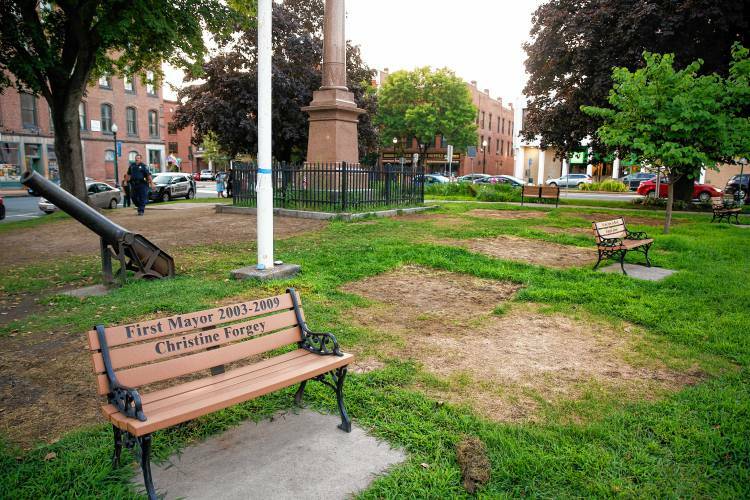 Late in August when the city evicted the approximately 20 campers on the Common, officials said they hoped to have a new shelter opened by Sept. 5. That has now slipped to Nov. 1 and at a different location than envisioned in August. The earlier plan was for social service agency Clinical & Support Options to set up a new shelter on High Street in a building it owns there. But now, according to Greenfield’s Community Development Director MJ Adams, the plan is for a different nonprofit, ServiceNet, to expand its existing overnight shelter. Adams said the plan is to use the second floor of the current 20-bed, single-floor shelter on Chapman Street. “We’ve been moving quite diligently on that possibility,” Adams said. The logical place for additional beds all along was the ServiceNet facility, Adams said, but city officials initially didn’t think the agency could expand. In early city talks with CSO, as the homeless encampment on the Common continued to grow in July and August, it seemed like that organization’s former shelter might be the best immediate solution. “We were really pleased that CSO engaged so quickly and so robustly,” Adams said. In the final days that the homeless were allowed to stay on the Common, ServiceNet offered assistance. “We need more shelter beds and it really doesn’t matter who is running them,” said Adams, who is now working with ServiceNet, which Mayor William Martin in August complained wasn’t doing enough for the homeless. Besides the overnight emergency shelter, ServiceNet runs two other shelters in Greenfield: a shelter for families and one for single women.Some of the Common campers said they dislike the ServiceNet overnight shelter, saying it is too cramped. Adams said the city helped to arrange beds for three of the Common homeless on the final day of the encampment and the three of them declined. “It’s really hard if they’re not moving into the things they’re making available for them,” she said. Some of the Common campers accepted an offer to move to a New York shelter run by a Turners Falls native, while others found other arrangements, shelter beds or have moved off to camp elsewhere in town. For decades, some number of homeless people have always camped in the woods near the center of the city, especially in warmer months. This was the first time that some of them settled on the Common. While city officials were initially flummoxed by the campers’ presence, the licensing commissioners and health board ultimately exerted their authority to evict the tenters. Longer term, Adams said, city and social service leaders hope to arrange for more single-occupancy rooms rather than simple shelter beds in a common space. Such a facility would give homeless people their own bedrooms, with aliving room, kitchen and bathrooms as shared space. This is still very much in development, though. Meanwhile, Adams met with a member of the Greenfield Housing Authority, an aide of Congressman Jim McGovern and state Rep. Paul Mark on Thursday to review the housing issue. They discussed the “housing first” approach, which is based on the belief that without a stable living arrangement, it’s difficult for homeless people to take advantage of social services designed to help them improve their lives generally. Adams said this is often brought up in the field as the best practice, but isn’t always implemented because of cost. Adams said that if the Democrats take back control of Congress in November, it could possibly lead to more aid for affordable housing.